Plug & Boom has among its projects a series of musical games with very special features. Our main concern when developing these games is on how to bring to the universe of educational games all the elements that provide fun, joy and pleasure to games used for entertainment. In other words, the medium is as important as the content. Beside that, we want to build games that bring the player closer to music, stimulating the player perception and sensibility through experience, and thus helping him to comprehend basic aspects of musical learning. Backing this proposal is a learning methodology used for more than 40 years at the Núcleo Villa-Lobos de Educação Musical, one of the greatest muscal schools in Brazil. The first game of this series, “Chili Crab – The Musical Notes”, was awarded at INOVapps 2014, in 3º place among more than 800 projects, and released for Android and iOS on May 2015. 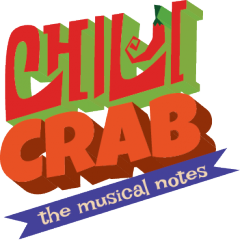 Chili Crab – The Musical Notes is a game created by artists and educators to teach kids, in a fun and engaging way, the names and the sequence of the musical notes, as well as their positions on the note staff. The content is based on a methodology developed over more than 40 years at “Núcleo Villa-Lobos de Educação Musical”, a renowned music school in the brazilian city of Belo Horizonte.